The Pale Blue Dot is the name of a photograph of Earth taken in 1990 at the request of legendary scientist, Carl Sagan. The famous picture provides a view of the earth from about 3.7 billion miles away – the outside of the solar system. The picture is grainy, but it is quite amazing to think about the fact that all human existence, past and present, has taken place on what in this scope is not even a full pixel. In the video below, Carl Sagan, the man who saw the importance of taking this picture, breaks humanity down nicely and puts our daily squabbles in perspective. If you enjoy that video, Carl Sagan has a book of the same name (Pale Blue Dot: A Vision of the Human Future in Space) which deals with a mix of science and philosophy. I have not read the book personally, but have heard countless good things from people who have. It is definitely on my “to read” list. As humans, we tend to lose perspective and live with a “zoomed in” attitude. We focus on insignificant issues and blow certain matters far out of proportion. 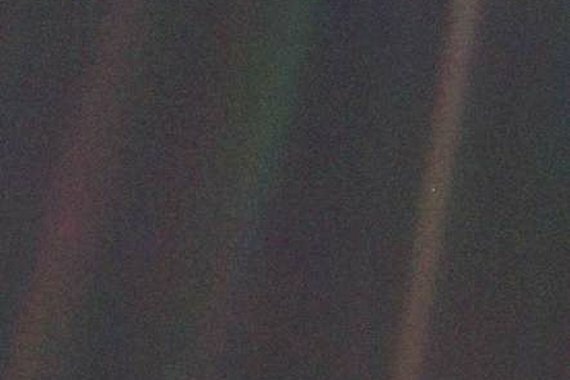 Because of this, I think it is very important to keep our perspectives in check and routinely remind ourselves that, at least for now, we’re all here together on this pale blue dot.